The roughly 3,000 turbines that line the San Gorgonio Pass like giant pinwheels on the road to Palm Springs generate electricity throughout the state. All told, they create 650 megawatts of clean, renewable energy per year—enough to power 195,000 homes. California receives nearly 5 percent of its power from wind energy, an amount that will contribute significantly to the 33 percent renewable energy goal set for 2020. The answer to our energy problem may be blowing in the wind. Electricity is produced when wind turns 144-foot blades, which then spin a shaft that churns out energy. The machines hum at a relatively quiet 45 decibels—lower than the whirring of a refrigerator compressor. Windmills take grain and grind it into flour. 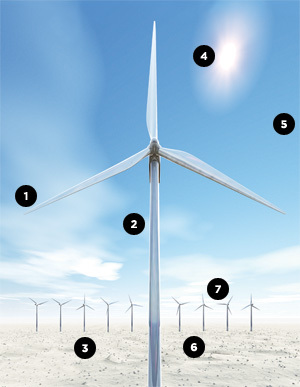 Turbines convert air into energy. The first units in the San Gorgonio Pass were installed in 1926. The big-gest model is the Vestas V90-3.0 MW, which stands about 400 feet tall, weighs more than 100 metric tons, and costs $6 million. About a dozen companies operate the turbines here. While wind power is one of the cheapest forms of renewable energy (it costs an average of eight cents per kilowatt-hour), making a foundation for the turbines is a $100,000 investment (325 cubic yards of cement atop 17,000 pounds of steel). Wind energy is an indirect type of solar power: The rays heat the desert air, which rises and pulls in cool air from the ocean. Some experts say coastline wind farms would be more effective. California is in preliminary discussions over onshore proposals. Generated electricity is transferred through nearby structures that resemble the Eiffel Tower. All three of California’s major wind farms are located in mountain passes (the other two are in Altamont and Tehachapi), where the wind is strongest. San Gorgonio’s turbines are densely arranged to harness a narrow pocket of powerful air. About 2,600 hours of usable wind blow through the San Gorgonio Pass each year at an average velocity of 16 to 18 miles per hour. If the breeze is blowing at less than 8 mph, the blades won’t turn. They stop working if gusts hit 55 mph and are sturdy enough to withstand hurricane-force blasts. 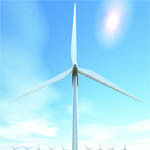 The turbines can run 24 hours a day.